Yes it's true its actually Spring! There's loads on for kids this weekend- and just a hint of Easter fun! For a foray into contemporary art, head to Pick Me Up, the UK’s first annual contemporary graphic art fair which returns for its biggest edition yet at Somerset House. The fair showcases the best new work from around the UK and the world with original works and prints available to purchase from just £10. Promises loads of events and workshops to get involved with! Suitable for all ages. Sky1 Cooks to Market- calling all cooks! Sky1 is giving amateur/professional cooks a unique opportunity to see whether they can turn their delicious food produce into life-changing business opportunities. Innocent smoothies, chegworth valley apple juice and ben and jerry's are just a few examples of food companies that began life on a market stall and have become hugely successful businesses - all started by people with a culinary passion. North London Mums has a really useful directory of local North London businesses and every week we will introduce you to one of the businesses who advertise with us. This week we want to tell you about Ellovie Kids, a family company that makes quality clothes for children, which advertises in our Shopping section. Some weeks ago we reviewed the Me Books revival of Ladybird Books for the iPad and we really liked these nostalgic, but fun app books. So we were very happy to hear that they have also launched a Me book for little pink Peppa, and set out to test it with the aid of our keen 3.5 year old assistant. North London Weekend Highlights - Wake up! It's Spring! Watford Palace Theatre is showing Tiddler and Other Terrific Tales all weekend - a brand new magical collection of Children’s Laureate Julia Donaldson’s most popular titles including Tiddler, The Smartest Giant in Town, A Squash and a Squeeze and Monkey Puzzle. For ages 3+. North London Mums has a really useful directory of local North London businesses and every week we will introduce you to one of the businesses who advertise with us. This week we want to tell you about Green Peas, a fantastic Natural Messy Play class which advertises in our Activities and Classes for Children section. Respected filmmaker Kira Phillips is making a documentary about Family Therapy for Channel 4. Kira is well-known for making documentaries about family life for both the BBC and Channel 4. Her most recent film, "A Dad is Born", looked at birth from the perspective of fathers and was shown on BBC2 in February as part of the Wonderland documentary strand. Kira’s now working on a high quality documentary project about Family Therapy for Channel 4. The project came about through Kira’s own experiences as a local mother who has found family support services helpful. She’s passionate about making a thoughtful and positive film on the subject, which hopefully helps to demystify the process of Family Therapy and makes it much more accessible. If your family is looking for support to help you work through the issues you’re facing, Kira and assistant producer Ayesha would love to hear from you. At this stage, they would really appreciate a confidential and informal chat with you about your experiences, with no obligation to take part in any filming. Any family they eventually work with will be offered a full course of Family Therapy, working with one of London’s leading Therapists. If you would like more information, please contact Ayesha on 020 7067 2463, or Kira on 07976 414689 / kirap@hotmail.co.uk. Phew a fab round-up this weekend, from St Patrick's day activities, to comedy for kids, to shopping (of course) and mother's day!- there's loads to choose from. Have fun! The Little Angel Theatre in Islington is showing The Gingerbread Man, from 18th- 23 March. Come and join in with The Rainbow Collectors re-telling of the popular story of The Gingerbread Man. Using puppetry, live cooking, and a sprinkle of imagination, The Gingerbread Man is brought to life in a brand new way. Goldilocks is also showing at the Little Angel Theatre, as part of the Spring Visitors Season. Using table-top puppetry and musical influences from around the world, this production brings this classic story to life with a twist. Tea and fashion combined at The Berkeley- heaven! Easter Holidays are nearly here and spring is definitely in the air. It's time to get planning and booking for the many fun things that are on. Check out our pick and have a great holiday. Mother's Day is coming up on Sunday. Tell us what Mother's Day means to you and you could win a £20 Boden Voucher which you MUST spend on yourself - and that's an order. This week's app is a great book of unusual stories aimed at 7-12 year olds called Tales for Great Grandchildren. The app is published by independent publisher JJ Books and draws on the folklore and mythology of India and Nepal, inspired by author John Jackson’s travels in those countries. A father, grandfather and great-grandfather himself, he has created an enchanting world of flying turtles, truculent tigers and talking lotus flowers that young readers will really enjoy exploring. Family Day out? 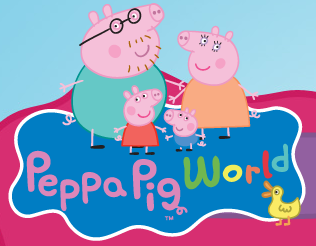 Head to Peppa Pig World! Little Angel Theatre is showing Eggy and Peggy - What happens when the lonely egg, sat on a wall, meets the sparkling pea from under that huge pile of matresses…? Join Eggy and Peggy the pea, a rock-n-rolling raspberry, cha cha-ing carrots, royalty and a blue horse in this deliciously funny and original twist on The Princess And The Pea. Pinterest is the new social photo sharing phenomenum which is sweeping the web and is particularly popular among mothers. North London Mums are addicted too (you can find us here) so we set out to investigate more. North London Mums has a really useful directory of local North London businesses and every week we will introduce you to one of the businesses who advertise with us. This week we want to tell you about a unique service run by Juliet Landau-Pope, a North London mum and professional life coach and declutterer who advertises in our Parental Support and Helping Hands section. Last week, we published a list of our favourite children's books as well as a competition where we asked you to tell us your favourite children's book, with a chance to win a £20 book voucher. We run-down your recommendations, and announce our lucky winner. Appy Monday! World Book Day? There's an App for that! World Book Day may have passed (and what fun it was- thank you so much for all your recommendations for favourite children's book!) but we did download the World Book Day 2012 App which promises lots of bookish fun long after WBD 2012. We very much believe that having children doesn't have to mean the end of your cultural life and we also believe that you can never start introducing your children to good music too young. Luckily, we've found a few places where you can enjoy good music with your children. This weekend in North London:magic, fairytales and much more! There's lots going on this weekend to inspire imaginations, from performances of Mozart, and a production of Goldilocks, to the last weekend to visit the Magic Worlds exhibition at the Museum of Childhood.